Because the G-Class isn’t expensive or exclusive enough in the first place. Around the time that a particular model is going out of production to be replaced by a facelifted or next generation version, an automaker tends to push out a few special edition units to move the last of its inventory. Until recently, Mercedes never really had to do that with its longest lasting dinosaur, the G-Class, but now that pop culture views the boxy off-roader as the new Cadillac Escalade, things have changed and a new emphasis has been placed on the SUV. That might explain why Mercedes has decided to release two special edition packages for both the standard G-Class and the one modified by the AMG outfit. Each special edition is sale now and will be delivered to customers by September 2017. 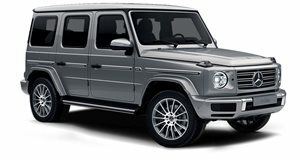 Continuing on a version released in 2015, the “designo manufaktur” Edition G-Class is now available for both the G 350d and G500 SUVs. Differentiating them from the batch are blacked out exterior design elements including five-spoke 19-inch AMG wheels, mirrors, a spare wheel cover, three grille louvers, and a variety of additional exterior trim features. These contrast well with the three available color options, these being Designo Magma Red, Designo Mystic White and Obsidian Black. Inside we see color-coordinated red top stitching on the designo nappa leather seats, an AMG Performance steering wheel with two-tone trim, red seat belts, black leather grab handles, and a black designo piano lacquer highlight trim. As part of the “designo manufaktur” Edition, buyers also get the Exclusive package, Sport package with the Exterior Stainless Steel package, and the Chrome package thrown in as standard. The AMG G63 and G65 specs don’t miss out on the special treatment either with the Exclusive Edition. This package adds a more flashy look to the SUV, if the quad side-pipe exhaust tubes didn’t do the trick, with the addition of a stainless steel underguard, dark aluminum rub strip inserts, and AMG sport stripes on the sides. Even the spare wheel cover gets painted to match the exclusive body color. Adding presence are 21-inch five-spoke light-alloy AMG wheels, though the G65 gets special ceramically polished units and both versions come with wheels painted in black. Available exclusively for this special edition trim is a matte AMG Monza Grey Mango color, which appropriately subdues a what is usually an attention-seeking exterior. Inside there is a two-tone leather-lined dashboard with matching leather upholstery and the choice of AMG sport seats with two-tone designo nappa leather offered in six colors. The buyer can also opt for three color options when the G-Wagon is fitted with two tone designo nappa leather seats with black carbon side bolsters instead. In either case, the seat and door panels come trimmed with diamond pattern stitching and customers can choose between AMG Carbon or black designo piano lacquer trim. Like the “designo manufaktur” Edition, seat belts come in red while the grab handles and a two-tone AMG steering wheel come matching the seat color. As expected, none of this comes cheap with the G 350 d and G 500 designo manufaktur Edition coming in at €109,878 and €121,683 ($120,014 and $132,908) respectively. Prices for the AMG G63 and G65 Exclusive Edition start at €163,125 and €287,658 ($178,173 and $314,194) respectively. Better saddle up those bank accounts if you want one of your own.